then the VRAM, and probably the On/Off switch. Failure can also be U 18 and U 19 (Joysticks). But if you're really unlucky then check your VDP. Look at these repair tips in this docx dokument. Power connection for CBS ColecoVision. LM 318 PDF. Power for Roller Controller. Joystick connection from DB 9. This version with 2 independent fire-buttons. ColecoVision Version. Scart connection pin for pin. Only for the 1983 French AV Out version. This version are Original, but different colored. CBS ColecoVision Scart connection pin for pin. 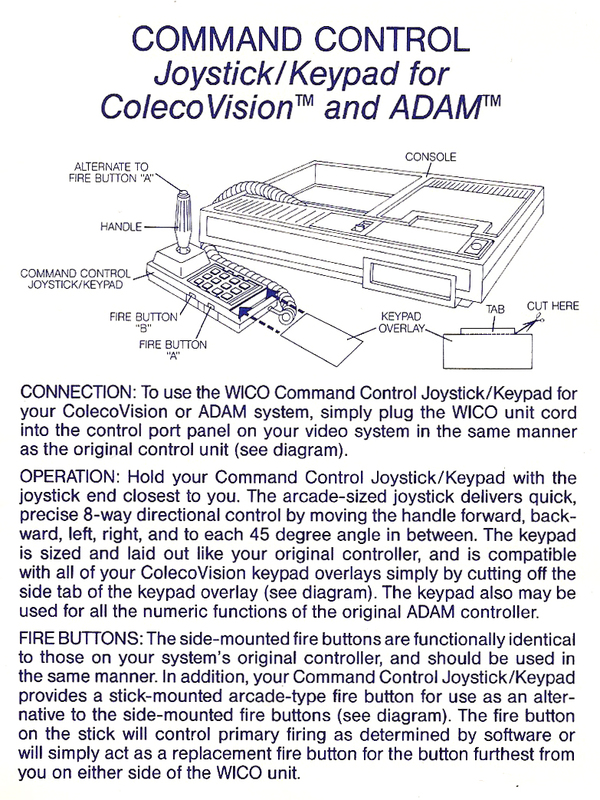 The I/O sound from the French CBS ColecoVision is not located at the same place as the ordinary ColecoVision. French I/O sound is located on pins 19 / 42. For higher SGM sound volume, try to pull a cord directly from the scart plug audio output inside your French CBS ColecoVision and place it directly to the CR5 Diode. It works for ColecoVision.dk, but remember, this is at your own risk and ColecoVision.dk disclaims any liability. Arcade machine from the 80's. This is the European version. Almost the same as those on the Right. This one is branded CBS Electronics. Note: This is 50 Hz. 220 - 250 Volt. and heavy as a rock, and have a weight for that too. Here is input power 60Hz. 120 Volt. Output power is the same. The French PAL Version. All 3 supplys are with same volt in output. EU : 19A 50 Hz. US : 25A 60 Hz. FR : 15A 50 Hz. The ColecoVision Bios: VTI / TI R72 114 A.
ColecoVision CPU: Zilog Z 80. Todays standard in c-mos are the eZ80 at 50 MHz. The TI Sound-chip for ColecoVision is SN 76489 AN. 5 oktavian and 1 white noise, Mono output. 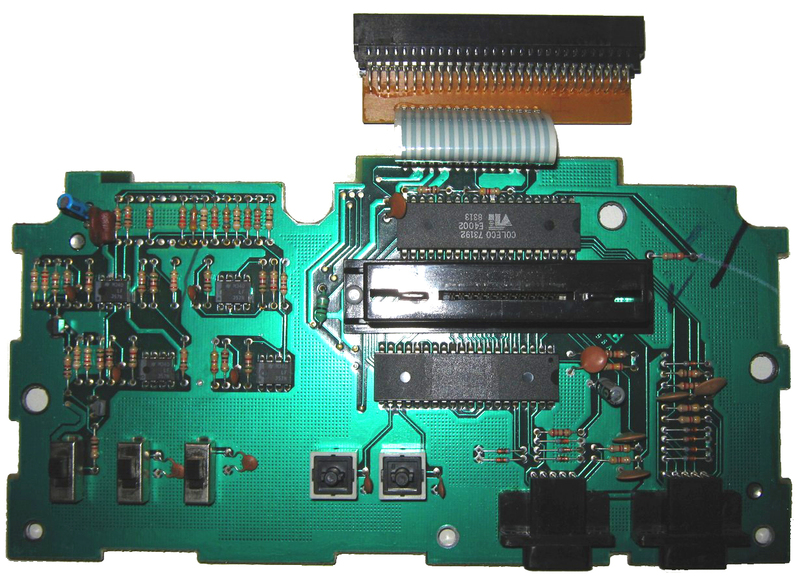 This is the GI sound chip for the Super Game Module. common graphic chip in the 80's. It have a palette with 15 colors and 1 transparent. Resolution is 256 x 192 and up to 16 K VRam. Data Sheet for the OKI MSM 9842 stereo voice chip. Can deliver audio in CD quality (44.100). 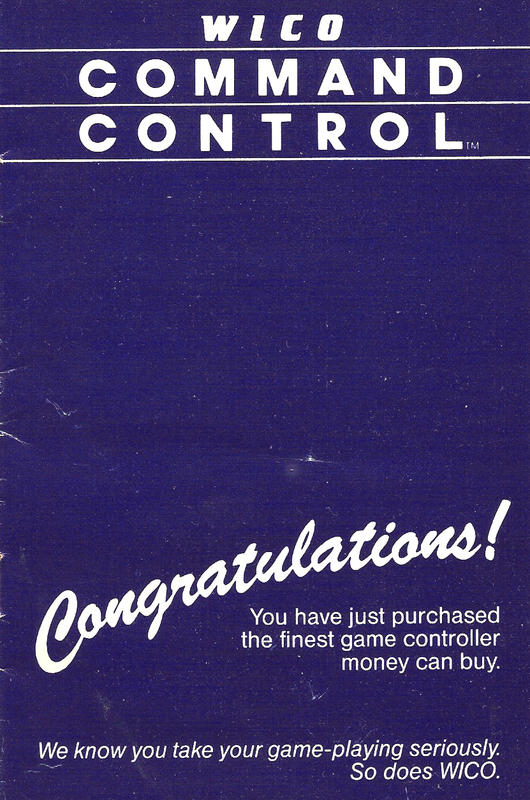 Will maybe be used for the later ColecoVision CV 2. (2018/19). The main-board for the expansions Module # 2. On the left: The steering Wheel main-board. PCB # 55888 Rev. D.
If you buy your own 3rd party steering wheel for your system. You'll have to use this electronic or develop something yourself. Here can you see what's behind your Roller Controller. Here are the Roller Controller inside. It's a kind of reverse mouse. But the ball are on top, so the name is: Trackball. If you use your own 3rd party trackball for your system. The Daughter Board / CBS PAL TV-Tuner Board. 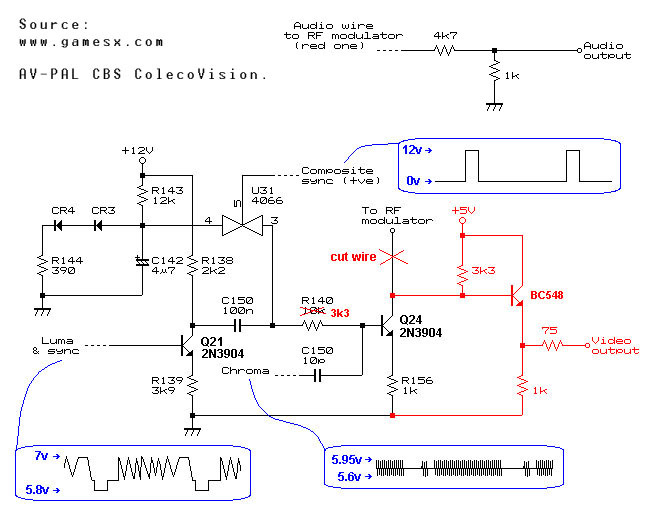 This is the Tv Tuner Board from the old CBS ColecoVision. It's a Daughterboard inside in the left side of the CBS ColecoVision. The Tv Tuner transmitting the signals from CBS ColecoVision over to this tuner. Tv and Audio mixes to a one single standard HF/RF out. The channel on this board is typical 3 or 4. 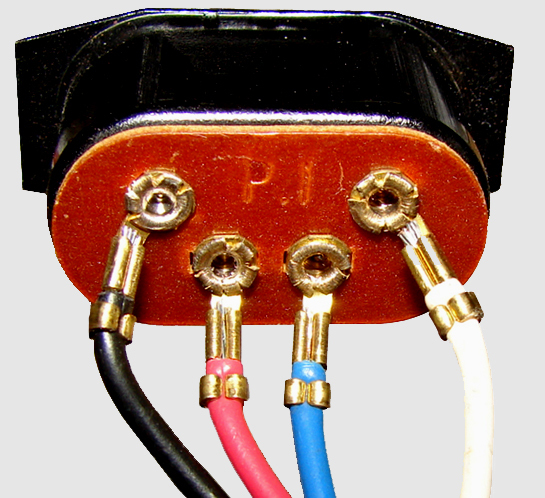 Male Phono (RCA) and DIN Tv connector for analog connection between CV. and TV. with these two screws (be very careful, soft black ferrit). then will these 2 screws solve the problem. PAL Tv. Tuner board, CBS version. This is without connector. (earlier 1982 version). As you can see, the wires are directly soldered into the PCB. from the CBS CV. With Connector (newer 1983 version). 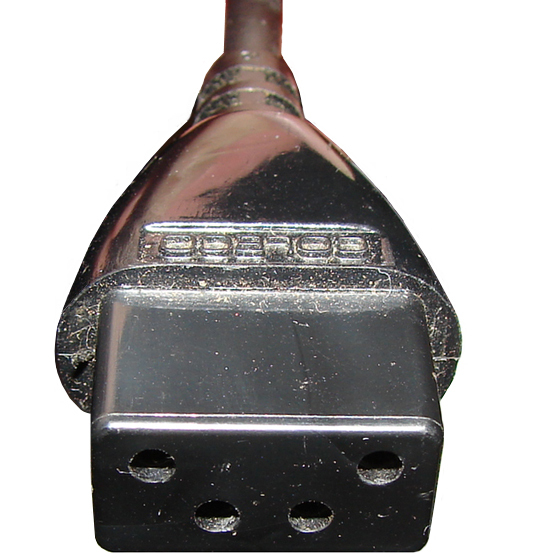 Connects directly into the male connector from the CBS ColecoVision. it can not be reversed incorrectly. There may be color differences between the wires. In this example, is it the brown wire (+12V). 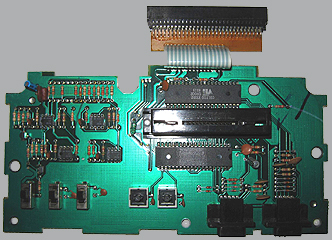 Atari Converter Connector board CBS ColecoVision Version. 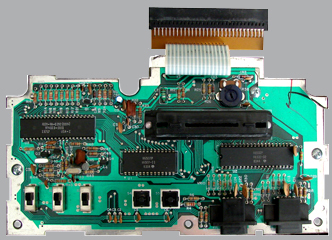 ColecoVision Atari Converter board for the expansion interface. Connector on the back on the Atari Exp. board. Connects the expansion interface on the front of ColecoVision. The showed is CBS Atari Converter do not work with The French CBS Scart Version. Warning This AV-PAL modification above are on your own risk. A newer Atari Converter inside. Rev. ? A older Atari Converter inside. ColecoVision Toy Shift Knob details. PDF provided by Todd Scheele. 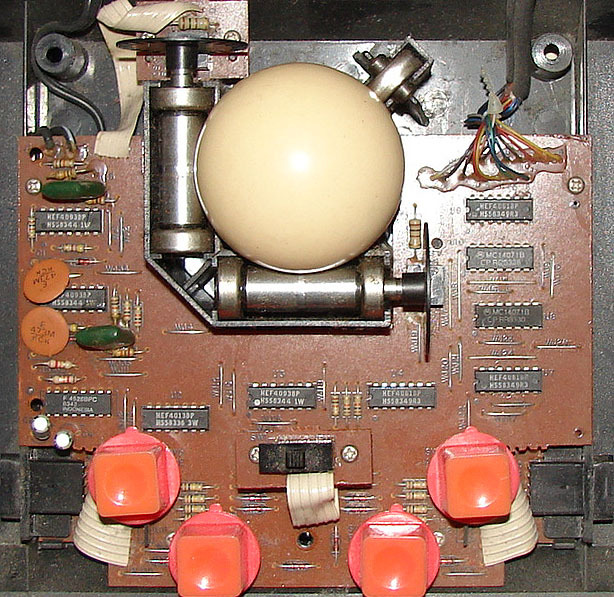 Wire connection between the power supply and ColecoVision. Only the White and Red wire er straight. The two others wires change from Blue to Yellow and from Black to Blue. This connection is from the CBS ColecoVision PAL version. This is the complete solution for a "total connetion". 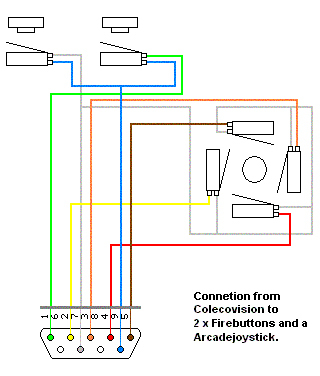 How to change your ColecoVision Power Switch. Last updated: April 28, 2018.